One: it's daffodil time and I've been buying a few bunches every time I shop. They smell wonderful. I love having them in the house, looking cheerful and bright. I put them all over, a few on the table, a few on the counter, a few on the coffee table in the living room so you see them as you come in the front door. Two: there's a mama dove in the juniper on the side of the house where we keep our trash cans. We think this is her second egg. There were shells on the ground under the tree a few weeks ago. Then we saw this egg and noticed she was back to sitting on the nest. We're trying so hard not to disturb her. We put out the trash on tiptoe. Three: I'm enjoying our new paint so much. This is the back porch (the sliding doors go into the breakfast nook). It looks so clean and fresh. Now I just want to replace that old, dated light fixture. In my excitement about the paint, I was inspired to buy a new patio umbrella. We haven't used it yet, but it's bigger and sturdier than the old one and I'm really excited to have our first meal of the season on the patio, hopefully soon. Four: our rosemary is blooming more than it ever has. I'm so pleased! We have two large rosemary plants along the front walk. I don't know if we did anything differently, but it's been on a steady course of improvement for the past few years and it's better than ever this year. I might even try cooking with it more now. It's completely edible, I was just afraid to remove any when the plants weren't as robust. I've been eating a piece here and there when I'm out there. We all do. Five: the new chickens are growing like crazy! Oh my goodness. We think they'll be able to go out to the coop by this coming weekend. They're still very sweet and funny. They're also becoming noisier and more rambunctious all the time. We love having them in the house but they're just about ready for the real hen life. Six: I'm making very slow progress on an amigurumi crochet project, the Dutch Rabbit stuffed toy by Kati Galusz. I love the look of this toy so much, and Dutch rabbits are my favorite kind, so I bought this pattern in the hopes of making one or two (potentially as Easter gifts for my children). I'm finding it so difficult, though - like really agonizingly so. The feet were easy; I could make those little front feet all day long. The head, though - holy moly. So hard. I've made the head three times so far and it's always wrong. I don't think it's the pattern, for what it's worth. My amigurumi skills are pretty rudimentary. I plan to keep trying, but these are some tough bunnies! Seven: a bit more promising is this sewing pattern, the Sailor Top by Fancy Tiger Crafts. I've never really sewn a garment for myself, aside from some stretchy-waist skirts, so I'm looking forward to trying this top. I really want some tops that aren't t-shirts, much as I love those. Pattern-wise, I also have my eye on designs from 100 Acts of Sewing. For now, I just need to find fabric for the Sailor Top. I spent some time at Jo-Ann over the weekend and was disappointed. I really want something light, like cotton voile, or maybe double-gauze, but there wasn't much to choose from. I'll probably order something online. I'm pretty excited to make something for myself! Hello from Spring Break Land! Well, actually, we're just here at home. We didn't go anywhere, exotic or otherwise. We decided that after the interminable recent illness and the past couple of months of endless school projects, it would be best to stay home and recharge our batteries. Did I tell you that the Bear was scheduled for knee surgery earlier this month? He had to cancel his surgery when everyone, including him, got sick. Now it's scheduled for mid-April instead. It would have been nice to have it behind us by now but that's life, right? Actually, it was kind of nice to have some "found" time before it gets hotter outside; we have been able to finish a bunch of projects lately. Over the weekend, we ordered a storm door for our bedroom, where we have a door leading to the backyard. It's a custom size - 32 inches wide as opposed to the more standard 36 inches - so we have to wait for delivery. I can't wait to have it; the room will get so much more light than it did with the old screen door and it will be much easier to keep the inner door clean. We've been cleaning like maniacs this week, actually. We moved the furniture in all three of our bedrooms, as well as the office/fourth bedroom, to vacuum and dust thoroughly. Mattresses have been flipped, bathrooms have been scrubbed from top to bottom, windows and window frames washed and some windowsills even re-caulked and repainted! Everything old is new again - or at least somewhat cleaner. In between blitz-cleaning, we've been cooking and baking together. We each came up with things we wanted to eat and put them on the week's menu. It's been kind of a hodge-podge - tacos, stuffed peppers, Gorton's fish fillets - but it's fun too. I've baked cookies. For a change of pace, I baked Pineapple Nut Bread, a quick bread recipe that we really love and I thought I'd share it here because it's kind of an unusual one. If you like fruity, nutty breads made with relatively little sugar or butter, this one's for you! 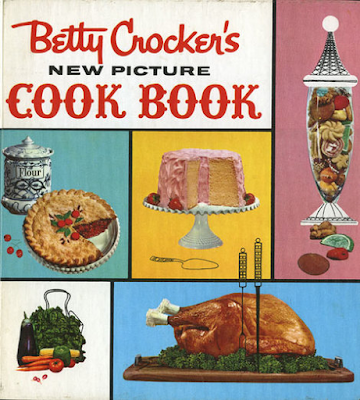 The recipe came from my mother-in-law's 1960's copy of Betty Crocker's New Picture Cook Book (when did "cook book" become "cookbook"? I'd really like to know). I think the book in this photo is the same one she has, though I'm not positive, and I don't have this book in my possession, but I like it. There are lots of really cool, stylized illustrations of sixties ladies, and many great recipes, as well as some very strange, dated ones that nobody makes anymore - hot, boozy broth drinks, copious amounts of aspic, so much mayonnaise. My in-laws make their permanent home in New Zealand, with several months of the year spent near us in New Mexico; this book is at their home in NZ and I encountered it while visiting them for Christmas in 2002, the year the Bear and I were married. (My in-laws are American expatriates, having retired to NZ in the 1990's). I didn't really know my in-laws until we made that visit. I had met them for the first time at our wedding. When we visited them in NZ, it was a good opportunity to get to know both of them. My mother-in-law and I did a lot of cooking together, which was a very nice bonding experience. She let me go through her cookbooks one day, looking for something to make when friends were coming. I chose this Pineapple Nut Bread based on the ingredients she had at hand. It was so delicious I decided to write down the recipe to take it home with me. I'm glad to have written it down because I can't find it online! Above is my hand-written recipe, which I carried home in my suitcase after our visit. I've made it many times since; it's an easy recipe that makes a very nice loaf. Heat oven to 350 degrees. Grease a loaf pan, 9x5x3 inches. Cream brown sugar, butter and eggs until fluffy. Measure flour by dip-level-pour method or by sifting. Blend dry ingredients in a separate bowl. Stir half the flour mixture into creamed mixture, add pineapple and juice, then remaining flour mixture. Blend thoroughly. Pour into prepared loaf pan. Mix granulated sugar and cinnamon in a small bowl and sprinkle over batter. Bake 45 to 50 minutes or until a toothpick inserted in the center comes out clean. Cool before slicing with a thin, sharp knife. I like to make this loaf with walnuts, but I'm sure other nuts, such as pecans, would work well. I always use pineapple in juice, as opposed to syrup. I think it tastes more like pineapple and it keeps the sugar content down, of course. I rarely buy small cans of fruit, just because they're more expensive, so with this recipe, I weigh out 8.5 ounces from a larger can and store the rest in a container in the fridge, or just feed it to my fruit-fiend children. The loaf comes out with a nice, crisp coating from the sugar topping, and it's delicious to eat right away, but I think it's even better the next day. The pineapple flavor deepens and the bread is much moister and a little sticky, more like cake. It's delicious with tea or coffee. Be careful slicing it; I find that the recommendation for a sharp, thin knife is a good one because a serrated bread knife tears it apart. I store my loaf in a rectangular plastic container with a tight-fitting lid and it's good for several days - on those rare occasions that it lasts for more than two. Year after year, it's the same - my plum trees bloom and I can't tear myself away from them, heading outside just to stand underneath, inhaling deeply and staring up into branches thick with frothy, pink blossoms. I take a lot of photos, which look about the same every year, playing with camera settings to try to capture exactly what I see. I want to remember them in brassy summer and in brown winter. I stand there for a long time. I probably look a little strange to the neighbors, but I think they're used to it by now. I'm always outside taking a picture of something - sky, trees, mesa and mountain. Things inside need my attention, but I stay just a minute longer as the petals take flight on a sudden breeze, coming back in the house with petals in my hair and in the folds of my shirt. There are some stuck to the bottoms of my shoes and I will find them later, dried stickily onto the tiles in the kitchen. Another year, another brief season of pink petals everywhere. My plum trees are important to how I mark time - the seasons pass but the years pass even faster. Spring is here again. I'm feeling better now, for the most part. The past few weeks have been really hard around here. I'm still coughing a little and feeling slightly run-down, but I'm trying to get extra rest when I can and I think I'll be fine soon. This illness really knocked me out, though; I feel like I dropped out of society for a week and a half. The Bear continued the exterior painting we started in early February and he's now finished with it all! We're really happy with the way it turned out. The cream trim looks fresh and clean. I'm especially excited about the courtyard, since we refinished the double front doors last fall. I can hardly believe this is my house. It's been good to make some improvements over the past few months. We needed to do them and it's just nice to have things spruced up, you know? The last step will be a new storm door for our bedroom, where we have a door leading out to the backyard. We had an older wooden screen door that really needs replacing. We're going with a better aluminum door with full-view glass and a retractable screen. It will be sturdier and will better protect the wood-and-glass door underneath. I'd been wanting to do this for years, but you know how that goes. I'm just glad we're finally doing it. I've baked twice in the past few days. On Sunday, I made two loaves of Irish soda bread (you can see my recipe here), to eat with our customary St. Patrick's Day dinner (a bit early). I roast a chicken and potatoes and boil wedges of green cabbage. I used to make corned beef but nobody really likes it. One time, a person from Ireland told me people would be more likely to eat roast chicken there anyway, so I switched. I don't know if that's true, or if she was just trying to help me feel better about disliking corned beef, but it made my life a lot easier. This morning, I baked an apple pie in honor of Pi Day. I try to make something pie-like every year. When I'm feeling ambitious, I make a chicken pot pie or a quiche, as well as dessert. Today, I only felt up to dessert. There are pi-related math problems planned for this afternoon's homeschool. We try to keep things nerdily fun around here, oh, yes we do. Thank you for joining in with my Winter Project Link Parties these past few months. I'm so glad people are interested in playing along. I hope it helped you feel motivated as the winter progressed and that you had the chance to give and receive some encouragement. I'm happy to know that there is already interest for next year! I would be happy to host the parties again. I will try to gauge interest again at the end of this summer, probably. While I was sick, I came across a couple of things on the internet that I wanted to share, just because I liked them. One is a sound recording, from YouTube, of the Beach Boys performing "God Only Knows," which I've listened to over and over again. The title calls it "a capella," but it isn't, really. The local recording-science enthusiast tells me it's actually an isolated vocal track, meaning it's what the singers are hearing in their headphones as they perform. Either way, it's beautiful, and in my experience, spine-tingling. Also, I love to browse a blog called Vintage Everyday, which features old photos of all different kinds of subjects, from period fashion to urban scenes to advertising art. 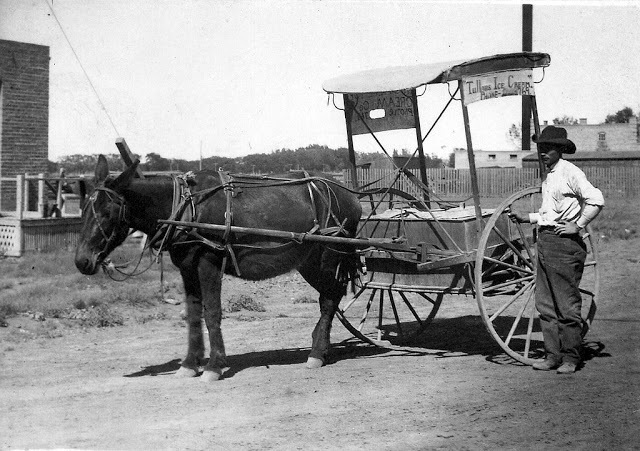 They had a post with old-time ice cream vendors a few weeks ago, including a donkey-driven cart from New Mexico which really captured my imagination. It might not even be all that old; there's a phone number on the cart awning. But how did they keep ice cream cold in a cart like this? They must have carried blocks of ice inside the compartment on the cart. I wonder if it was lined with cork. I really need to research this. For me, ice cream - including historical ice cream - is serious business. (Well, we hope they're all girls). We have acquired three new chicks. We still have Betty, from our first flock, and we love her lots, but we wanted to start fresh with a few new girls. There's a Buff Orpington, the same kind which turned out to be a male last time, so we're watching out. There are also two New Hampshire Reds, which look a lot like our late Penny, the Rhode Island Red we just lost a few weeks ago. We haven't named them yet, but I have a feeling it will be harder than last time. The small Bears are much more opinionated now. So far, I've heard votes for Ginger II (the Buff Orpington), and Cheetah. I'd love to stick with old-lady names myself. We'll see. We were so eager to get some new girls. It would be really nice to have eggs again, and who doesn't love baby chicks? If you want to feel like spring is really here, get yourself some newly-hatched chicks. We tried to improve on what we did last time for their incubator. The Bear built a really nice removable lid with a wood frame and chicken wire (last time, we used a plastic grate from a box fan - we hadn't anticipated all the climbing and flying and needed something in a hurry). The box has a clever little wire holder in one corner to hold their water dish stationary, so that the new babes can't tip it over eleventy times a day like the previous babes did. Just to be safe, we also added a few rocks to the dish to weigh it down. The basking light didn't stay on top of the lid for long; they were too warm under it and we found them huddling in the shadow of the feeder. We ended up putting it on a pole like last time; not everything in the new plan was better. Honestly, I really enjoy having them in the kitchen for the few weeks until they're ready to go in the coop. They're very busy and they're noisy, but in a cute way. I've noticed that they really perk up when the dishwasher is running, suddenly chirping and cooing a lot more. They're singing to the dishwasher, I think. I'm a pretty big fan of the dishwasher myself, so I get it. I'm so excited to see what they'll be like as they grow, and how they'll do with old Betty. I never dreamed of becoming a chicken person, but here I am - total chicken person! Thank you to everyone who has signed up for my Winter Project Link Party so far! It's the last one for the winter season, so please feel free to join in if you haven't already (the party closes late on Saturday). I've been really sick for nearly a week with a nasty flu-like bug (seriously, don't catch this illness, it's brutal). I'm slowly getting well and am looking forward to visiting your posts soon! Welcome to March's Winter Project Link Party! This is our last link party for the winter; it's hard to believe we're in March already! I hope you'll want to join in with the party and share what you've been working on this winter. It doesn't matter if you haven't linked up before, all are welcome to join! 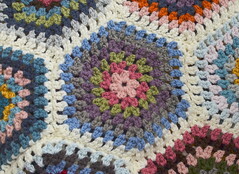 I'm still working on my Sunburst granny squares. We've been inundated with illness at our house lately (including me right now - hack), so I haven't been crocheting as much as I was a few weeks ago, but I've still managed to finish about ten squares since the last party, and I've joined a few more too. I'm still enjoying the squares a lot. They're easier than they look and they make up really fast. 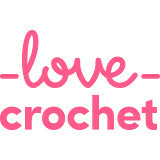 It's so nice to feel inspired by crochet again; I went several months feeling bored and antsy with everything I tried, and now I'm feeling motivated and excited. I'm in no hurry, though; it's nice to have a smaller-scale project to pick up as I feel like it. I'm also working a little at a time on a small chevron-ripple throw. I had lots of worsted-weight acrylic yarn, taking up precious craft-storage space, and I've decided it's time to use it. 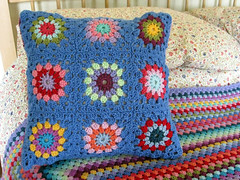 I was thinking about making a new throw or two for the living room, so this is a great use for the yarn. I have odd amounts of each color, so I'll just use as much as I have and move on to the next. I really like doing a ripple design. This one is a basic 19-stitch repeat: 8dc on the uphills and downhills, sk2 in the valleys, 3dc in the peaks. Neat and sweet. If this is your first time joining in with my link party, please see this post for more information. 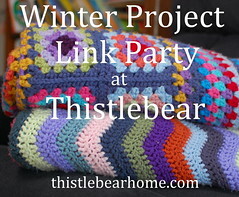 Please be sure to link back to this post in your winter project post to help spread the word about this link party! Grab a link party button (code is below) to display on your blog! Hello and happy March! I have something a little different to share with you today. 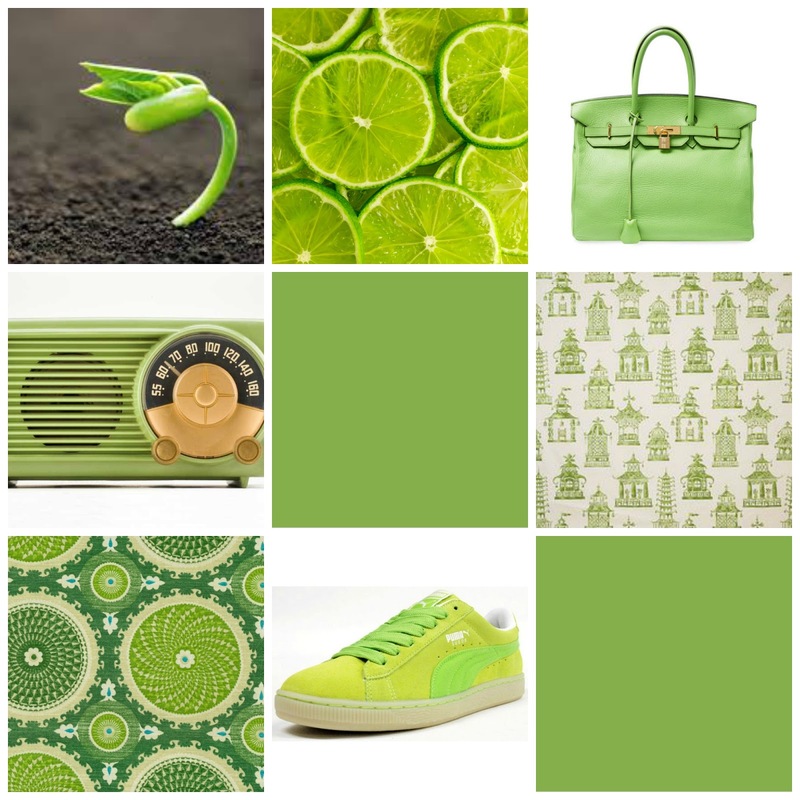 I was inspired by Douglas Elliman, a realty company in Florida, to participate in a style board challenge to share and celebrate Pantone's Color of the Year 2017, Greenery. They asked me to come up with ways that I would use Greenery in fashion and decor. It was definitely challenging; Greenery is bold and fresh but not necessarily a color that I have given serious thought to bringing into my home. That changed once I started looking at it, because it's really inspiring. Are you familiar with Pantone? They are the worldwide authority on color and provider of color systems and technology for the communication of color across a variety of industries. Graphic artists, printers and manufacturers rely on Pantone's systems for accurate color control. Each year, Pantone selects a color from their vast catalog to symbolize the current global culture and social climate. 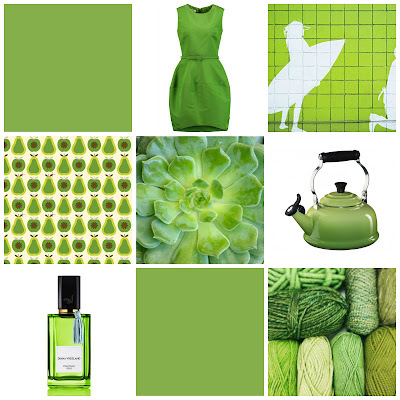 To Pantone, this year's color, Greenery, symbolizes new beginnings. They've called it "life-affirming" and "emblematic of the pursuit of personal passions and vitality." Well. That's high praise for a color that is all around us but often goes unnoticed in our hectic lives. Exploring Greenery has been particularly interesting for me as a desert-dweller. It's easy to miss the greenery in my world, especially in wintertime, but I try to be attuned to it. Now that we're heading into spring, I'm spotting delightful bits of new greenery everywhere: sun-searching tulips, hyacinths, irises and daffodils poke from the soil; starry chartreuse flowers adorn my little New Mexico olive tree; cabbage-curled mint shoots appear in my raised garden bed. This time of year, even the tiniest flashes of green catch my winter-weary eye. 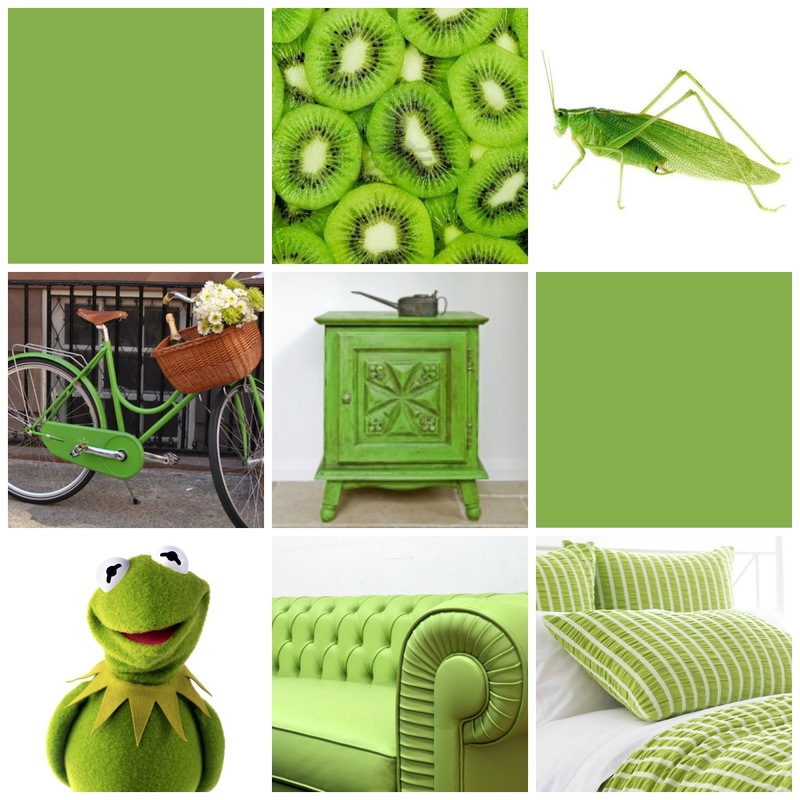 This color can come indoors too. In my online travels, I came across many household items in shades similar to Greenery, from bedding to upholstered furniture to lighting and glassware. You can find lots to wear in this color too. 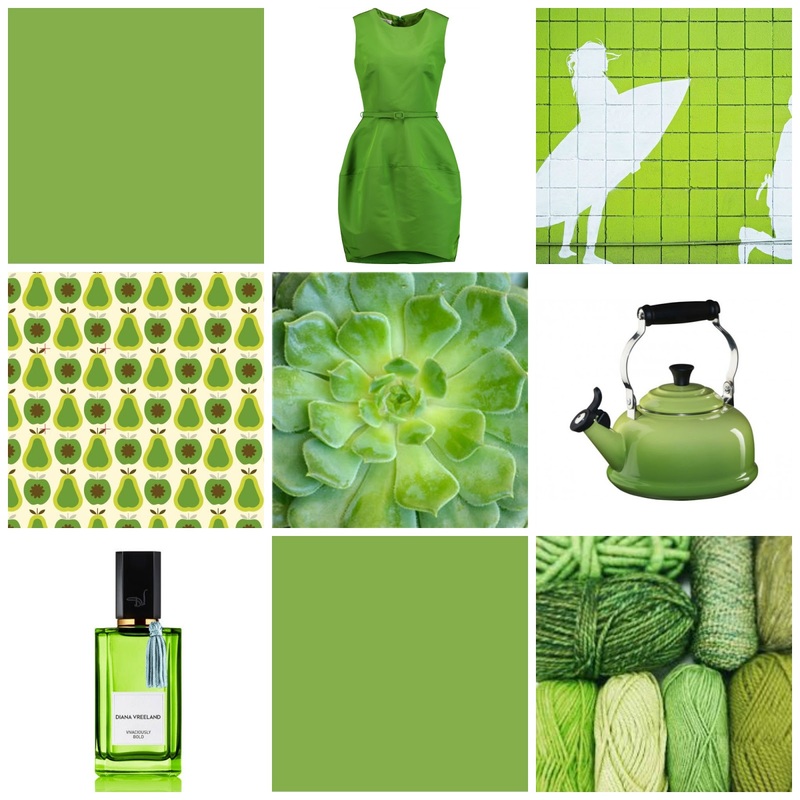 You can even buy nail polish in this year's Pantone color; would you wear Greenery nail polish? It's a bit intense, but I think I might do just my ring fingernails with it, why not. It's interesting to think about how many different kinds of things in nature bear this color. 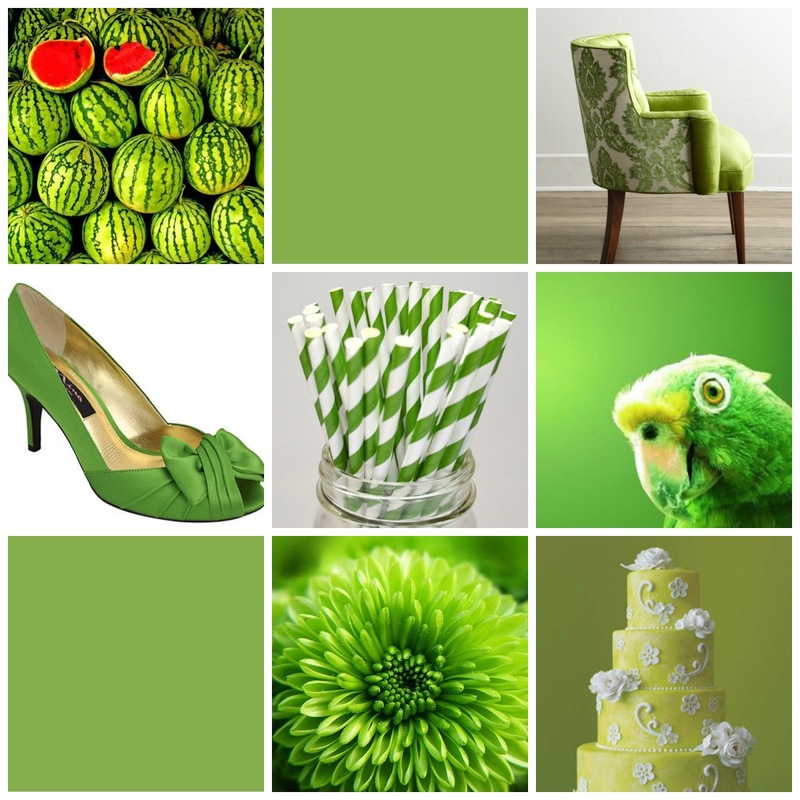 Fruits and vegetables, birds, insects and leaves are tied together by a fresh, crisp color that reminds us of life itself. You can connect indoors and outdoors with Greenery - big splashes like a leather sofa or painted wood furniture, or simple touches like table linens, towels, throw pillows or houseplants. This challenge gave me the opportunity to indulge in one of my favorite pastimes - imaginary kitchen renovation! Yes. 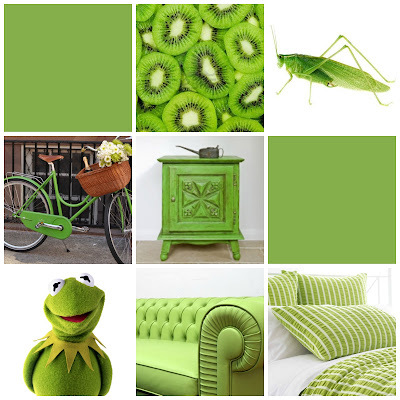 I do this quite often and it was fun to think about a color I hadn't considered before. My usual kitchen fantasies tend toward neutrals and soft, pastel shades. If I were using Greenery in my kitchen, I'd probably use it as an accent color in the breakfast nook, just one wall or maybe two half-walls above white beadboard paneling with a chair rail. With Greenery on the walls, I'd want crisp, pure white on the cabinets and counters. I'd go with a simple cabinet style and white crystal quartz counter tops. Glass tile with touches of green would brighten the stove and sink areas. 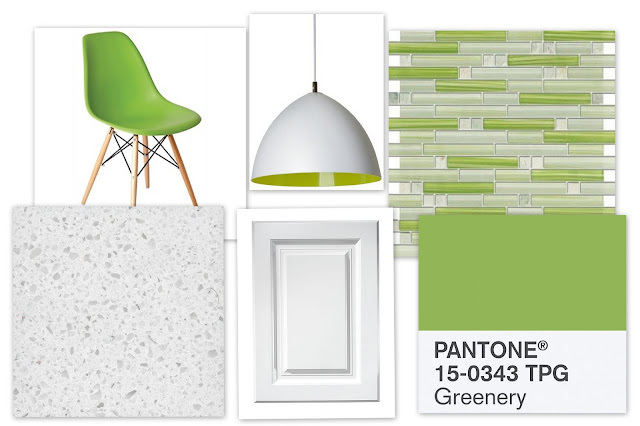 I'd keep my birch kitchen table and white chairs, but how about green Eames chairs instead of green walls? Over the kitchen table, I'd hang a simple metal pendant light, white with green inside. There would be a basket of Granny Smith apples on the table at all times, of course. 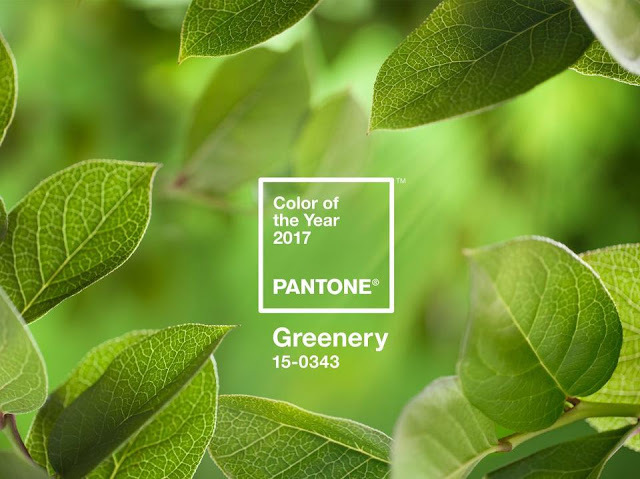 What do you think about Pantone's Color of the Year 2017, Greenery? How would you use it?